So, that’s our question for today: If President Trump withdrew Kavanaugh’s nomination, would that depress conservative turnout in the midterms? And somewhat relatedly, would it have a long-term effect on “Trump’s relationship with the conservative legal movement”? Give me your topline views, and then we can get into it. Also, welcome, politics editor Sarah Frostenson, to your first politics chat!!! sarahf (Sarah Frostenson, politics editor): Hello, hello! Even if it’s partly true, the alternatives for the GOP could be a lot worse. The base might be despondent initially, but there’d be an opportunity to rectify that if Trump successfully rolled out another conservative candidate. micah: Having a topline view with three parts is very on-brand. perry (Perry Bacon Jr., senior writer): Trump has appointed a huge number of conservative judges to the federal courts, most notably Neil Gorsuch to the Supreme Court. The conservative legal movement will be fine with him as long as he keeps doing that, so replacing Kavanaugh with another conservative would do the trick. And I think there is very limited evidence that conservative voters, as opposed to conservative activists, are motivated by Supreme Court nominations. sarahf: Damn, I think Perry took some of my topline views. I would add, though, that given the partisan divide on issues of sexual misconduct, Kavanaugh withdrawing or President Trump asking for him to withdraw (which I think is unlikely) could backfire among the base. perry: So you think Republican voters will be turned off because they think Trump would be bowing to liberal views on sexual harassment/misconduct/assault. micah: Yeah, and maybe that plays more of a role in how the GOP base reacts than their views on the Supreme Court. sarahf: Yes, I think that could happen. They might see him as weak, giving into liberals, etc. 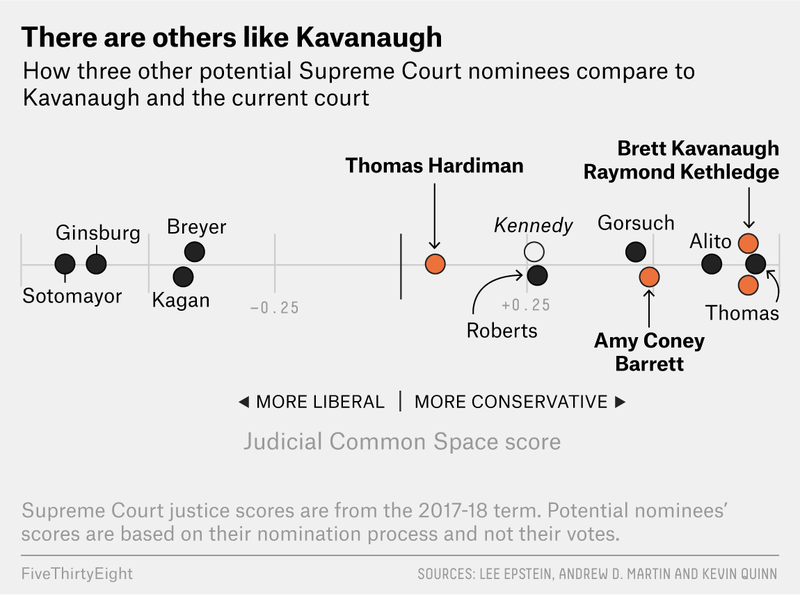 First, the idea that Republican/conservative voters really care about the Supreme Court — more so than Democratic voters — does have some evidence to back it up, right? perry: So the exit polls from 2016 would seem to say that. Among voters who said Supreme Court appointments were the most important factor in their vote — about one-fifth of all voters — Trump beat Hillary Clinton 56 percent to 41 percent. Among the 14 percent who said such appointments were “not a factor at all,” Clinton won 55-37. Still, I think this is a bit of a misnomer. How much did Clinton talk about the Supreme Court? How much did liberal activists prioritize the court during the campaign? I don’t have a study on this, but my guess is less than Republicans. Remember, Trump felt compelled to put out a list of his likely Supreme Court nominees before he was elected. The court is a core part of the GOP’s campaign message. Also, it’s a lot easier to say, “I’m deciding who to vote for because of the Supreme Court or abortion,” rather than, “because I have negative attitudes about blacks and Latinos,” which we know motivates a lot of conservative voting. natesilver: The other issue with that exit poll result is that when you ask voters to volunteer a list of which issues are most important to them, the Supreme Court barely registers. So, sure, when you remind people about the Supreme Court, many of them say it’s important. And Republicans are a bit more inclined to say so than Democrats, which isn’t meaningless. But it isn’t generally a top-of-mind issue. perry: It is true, though, that if you wanted to accurately describe Trump’s base or the Republican base, white evangelicals would be a big part of the description. But I don’t know if it follows that therefore because white evangelicals are the base, abortion/LGBT issues motivate them, as opposed to taxes, immigration, health care, etc. micah: Let’s posit for the moment that the prioritization of the Supreme Court among rank-and-file GOP voters is overblown — isn’t it still a priority among GOP activists, Sarah? And doesn’t Trump have to worry about that? Like, I’m not sure if there’s data to back this up, but I feel pretty confident in saying that Republican activists are more engaged on the courts than Democratic activists. sarahf: He does, but I would counter that he’s already done quite a bit to remake the federal judiciary. The Supreme Court gets all the attention, but if we look at the lower federal courts, we can see that 26 of Trump’s federal appeals court picks have been confirmed (more than any other recent president at this point in their first term). micah: Yeah, so it’s unlikely they would abandon him over this? sarahf: Plus, there’s 142 vacancies to fill across the federal judiciary. More than 100 in U.S. District Courts alone! perry: Micah, it’s a common view that conservative activists care more about the courts than liberal activists, in part because the Federalist Society has an outsized role on the right, and I don’t think the American Constitution Society (the liberal equivalent) has that same role on the left. But the NAACP Legal Defense Fund, for example, is pretty focused on judges and the law, and it is longstanding and influential. I would say, though, that Trump has been more invested in appointing judges in his first two years in office than Barack Obama was. I think we can say that confidently. sarahf: And to Perry’s point, I think this registers with his evangelical base. natesilver: We’re also having this fight over Kavanaugh against a backdrop where we’re in the midst of what looks like it’s going to be a blue midterm, maybe even a wave year for Democrats. And that tends to color voters’ impressions of everything. Because the public is skeptical of Trump and the GOP overall, everything they do is going to be taken in a more skeptical light. So some fights that might be winnable in, say, 2014 might have a lot more downside for Republicans this year. micah: OK, but Nate, how do you square the exit poll results showing people who cared about the Supreme Court most overwhelmingly backed Trump with the open-ended Gallup question finding hardly anyone thinks of it off the top of their head? natesilver: If you ask someone about something, of course they’re gonna be more cognizant of it. It’s kind of like if I ask you, “How important is personal fitness to you?” Most people are going to say it’s “somewhat” or “very” important. But a lot of those “somewhat important” people probably aren’t going to the gym, aren’t really watching their diet, etc. micah: It’s very important to me! I play basketball every day! Oh, you meant in general. natesilver: I’m not making an accusation about you personally, Micah, but nice #humblebrag. sarahf: That’s fair criticism, but we are talking about a conservative majority on the highest court in the land. It could be that it really does matter to Republican voters more this time around. natesilver: But, Sarah, if they don’t get Kavanaugh, they probably get … someone equally conservative. Or maybe more conservative. Unless they screw it up by spending several weeks fighting this possibly very stupid fight, to the point where they jeopardize the timing of his replacement. Yeah, it’s 41 days until the midterms? Democracy moves slow. I think the reluctance of the GOP to move on from Kavanaugh is tied to that. perry: There is a core of Republican voters who care deeply about, say, limiting abortion and were not happy with the Supreme Court’s gay marriage ruling. I just think people who volunteer for campaigns and knock on doors are pretty politically active and will not make the weird decision of not voting Republican simply because Trump, who has executed lots of GOP policies, isn’t able to get Kavanaugh through. They might be annoyed. But the idea that they will not vote at all seems far-fetched. The people I would worry about if I were Trump or Senate Majority Leader Mitch McConnell are voters who backed Trump in 2016 but often stay home at midterms and might do so again. I doubt that group is following every development in this story. natesilver: Plus, there’s the chance that Trump doesn’t abide by the script and nominates Thomas Hardiman, who’s more moderate than some of the other names on the short list, or something. But, again, this isn’t about finding a good outcome for the GOP; it’s about cutting their losses. micah: OK, so let’s talk about Sarah’s point that this could be viewed by GOP voters as Trump caving on a cultural issue more than about the court in particular. There’s definitely evidence that cultural issues have a lot of sway with voters, no? natesilver: I’m not sure what you mean by “cultural issues” — but, sure, in some sense cultural issues (especially if we recognize the very, very strong overlap between “culture” and race) is the whole reason Trump was elected. perry: I’m not sure. But if I were Sens. Ted Cruz or Dean Heller, I would not equivocate on this issue and suggest that I believe Christine Blasey Ford (the woman who says Kavanaugh sexually assaulted her when they were both in high school). Just in terms of politics, I do think the GOP base expects Republican politicians to view sexual misconduct claims skeptically, particularly those made against Republican men. sarahf: Perry wrote this piece earlier in the week: Republicans largely don’t believe Ford’s accusations are credible. natesilver: At the same time, #MeToo has also been challenging to a lot of male elites. They clearly care about it a lot. And, again, there’s probably a lot of transference wherein they assign their own feelings to those of the amorphous base. micah: How does Trump figure into all this? natesilver: I think the best thing Trump could do for the GOP is to stay the hell out of it. He’s absolutely the last person you want talking about the credibility of women accusers. But, yeah, if he invests himself too much in the story, it becomes more painful for Republicans to fail to confirm Kavanaugh. perry: He was literally criticizing one of the accusers while this chat was happening. natesilver: I know. And if McConnell is sort of play-acting and ultimately would be just as happy to replace Kavanaugh with someone else, Trump is a big wild card there. micah: Nate, you and Trump and McConnell are not on the same page. natesilver: I’m not sure that “Cocaine Mitch” and I aren’t on the same page. micah: We argued about this on the FiveThirtyEight Politics podcast, but I don’t see how you square Mitch’s actions so far with a strategy of ditching Kavanaugh? natesilver: There’s a good chance he’s trying to save face. He may also be trying to expedite the process so that Kavanaugh gets voted up or down (or has to be withdrawn) within a week instead of after several weeks. I put a lot of emphasis on the fact that McConnell reportedly didn’t want Kavanaugh to be chosen originally. I give him some credit for just being a good overall strategist who sees a couple of moves ahead. perry: I understand Nate’s argument, but I found McConnell’s remarks on Friday (in a speech with conservative activists, he pledged that Republicans would “plow right through” the opposition to Kavanaugh and get him confirmed) to be somewhat in tension with that. But maybe the remarks were part of the strategy. He does think ahead. I agree. natesilver: Yeah, I will say — I was more convinced of the McConnell-is-bluffing theory before the story got so much more involved with the new accusers and Trump tweeting and everything else. Maybe now McConnell has to commit to the bit. sarahf: I dunno. I think that at this point, McConnell is busy on doing what he has to do to get Kavanaugh nominated. He might have had reservations about him initially, but I think all signs point to him pushing this through. This was written before news of other allegations broke, but I haven’t seen any reporting that makes me think this isn’t still the case. OK, to wrap up: If the consensus here is that the danger to Republicans in the midterms of pulling Kavanaugh is overblown, is the same true of the danger of pushing him through? natesilver: I’m not sure you necessarily encounter a point of diminishing returns. If, I don’t know, 60 percent of women are slated to vote Democratic for Congress, there’s still 40 percent of women who aren’t yet planning to do so. It’s also always probably true that pundits (and data journalists?) overrate the long-term electoral importance of whatever the story of the day is. Although we’re close enough to Nov. 6 that this may be fairly fresh in voters’ minds. perry: It is hard for me to see a bad political outcome here for Democrats. Their base is angry about this issue and will likely be more so if Kavanaugh is confirmed. Democratic senators who are up for re-election this year in red states — Joe Donnelly, Joe Manchin and Heidi Heitkamp, for example — know their states better than I do, but it’s difficult for me to see a “no” vote on Kavanaugh hurting them. Cruz has to vote “yes,” as does Heller, but I don’t think they will be eager to defend that vote. natesilver: There’s a decent argument that even though Kavanaugh might be unpopular, he isn’t any more unpopular than Trump or, say, the GOP’s health care bill. Lot of particularly bad polls for the GOP this week, especially in upscale suburban-type places. The difference between the Democrats and Republicans is 1 point, but still! natesilver: Yeah, I’m not sure what to make of that. micah: On that note! Final thoughts? natesilver: I get that there are a lot of Republican elites who would love to see Kavanaugh confirmed and who don’t want to back down from a fight. I think they ought to think about whether this is really the hill they want to die on. sarahf: My main final thought: I look forward to moderating these chats (rather than having to answer questions). But in terms of the real question at hand, I think conservatives think they have more to lose (a conservative majority on the Supreme Court) from abandoning Kavanaugh’s nomination than from ramming him through. Plus, I think there’s enough evidence to show that the Republican Party doesn’t really see the allegations against Kavanaugh as a problem, which is reflected in how party leaders have chosen to combatively press onward.